This is my first review so please be gentle with the comments! This beer isn't necessarily my favorite, I'm not even sure I have one, but it is an awesome dark ale. I thought long and hard about how to start my blog off and while I debating I decided to start with what I was drinking at the moment. 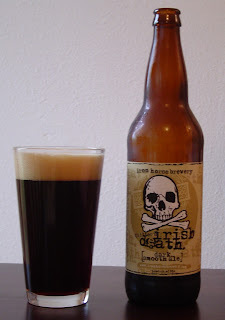 The first time I tasted Irish Death, it was on tap at the local Iron Horse Brewery here in Spokane Valley, Washington (One of my most frequented local pubs). I'm not going to lie, the name is what made me order it. I mean how can you not order a beer named Irish Death?! The first thing that hit me as I walked the pitcher back to my pool table was the scent. By the time I got back to my buddies I couldn't wait to pour our pints. As I took my initial drink the first taste I got was the roasted malt with undertones of chocolate (and maybe caramel?). Very sweet and very smooth with almost no aftertaste lets this dark ale easily hit my top 10. It pours a fairly dark brown, almost black with hardly any head at all. Just looking at the beer made me expect something different, like a stout vs the porter it tastes like. When held up to the light I was just barely able to see through it. My Suggested Pairings: Drink this beer with something hearty like a steak or some dark chocolate. Iron Horse's website suggests drinking it with "your friend's meatloaf" but I don't. Stay away from light, tangy foods and buy this one to go with something that has body. Seriously, I have a lot of friends who love this beer. One of them lives near The Source in Ellensburg. We here in West Richland have a shop that sells it on tap by the growler, and we do pick one or two of those up every so often. I wonder if it tastes as good out of the bottle as out of a tap? Thanks for the comment! Do you share your recipe for meatloaf? I'd love to try a good one as they are few and far between. I was drinking it out of the bottle (poured into a glass) as I was writing this review and it was comparable. I mean, there are very few beers that are as good out of a bottle as they are out of a tap but this is not bad. The price was a little hefty from Albertsons ($5.49 for a big bottle) but I think it was worth it. Some people don't appreciate when there is a light sediment at the bottom of their glass when the beer is gone but I was happy to see the reminder of the drink at the end.